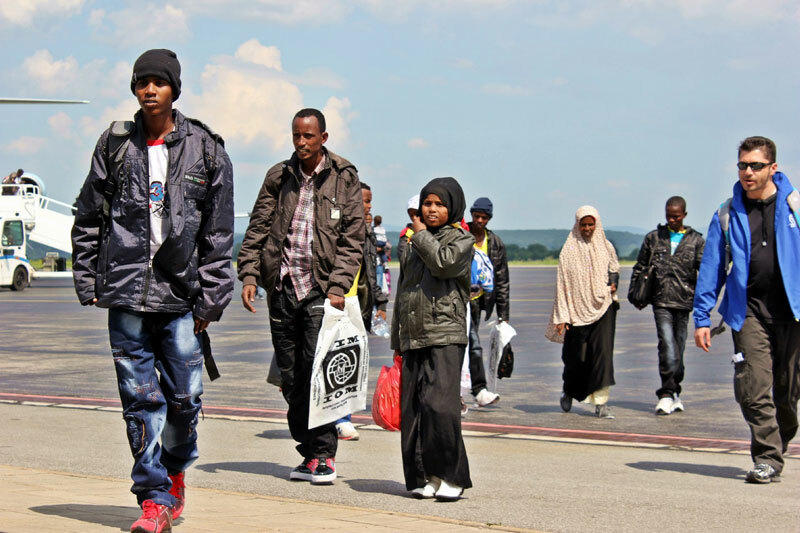 Slovakia - IOM announced today that over 1,000 refugees have been resettled through Slovakia’s emergency transit facility to the USA, Canada and Norway since 2009. On Tuesday (17/01), 23 refugees departed from Slovakia and arrived safely in the US, bringing the number of refugees resettled from Slovakia’s Emergency Transit Centre (ETC) in Humenne in other countries to 1,019, with 978 resettled in the United States. Following successful negotiations between UNHCR/IOM and host countries to provide more timely and effective protection for refugees in emergency situations, two Emergency Transit Centres were set up in Europe to temporarily house evacuated refugees and facilitate their resettlement in safety – one in Timisoara, Romania (2008) and the other in Humenne, Slovakia (2009). Between 2009 and January 2017, the Slovak Republic provided 1,043 refugees with temporary accommodation in the ETC Humenne to enable officials from resettlement countries and UNHCR to conduct interviews in a secure environment. Refugees stay at the ETC for a maximum of six months, during which they prepare for resettlement by completing IOM health assessments and pre-departure orientation courses. IOM also arranges international transport to their resettlement destinations. UNHCR provides travel documents, health care and social services for the refugees. The Slovak Republic grants visas before their arrival in Slovakia and provides them with accommodation, meals and basic hygiene items during their stay at the centre. More than half of the refugees transferred to the Centre since its opening have been Somalis, followed by Afghans, Ethiopians, Eritreans, Iraqis, Palestinians and Sudanese. Most were families with small children in need of urgent protection and unable to return to their home country or stay in their country of first asylum. Mahmoud, a refugee from Somalia, told IOM that he appreciated the Centre’s safe environment, health care and special attention paid to malnourished children, who come from refugee camps all over the world. “The word ‘happy’ doesn’t adequately describe how I feel now,” said Mahmoud before his resettlement to the United States. The ETC organizes activities for the refugees through a Slovak NGO, ETP Slovakia, a UNHCR implementing partner. Small children go to kindergarten and older children attend school, where they learn mathematics, geography and English. Parents can take part in literacy and computer courses or English language classes. “These activities are important because they not only enable the refugees to gain new knowledge and skills, but also help them forget the traumas they suffered, if only for a while,” said Zuzana Vatráľová, head of IOM Slovakia. IOM’s activities under the project are funded by the United States through the United States Refugee Admissions Program (USRAP) or by similar programmes in other resettlement countries. IOM vaccination activities are funded by the US Department of State and US Department of Health and Human Services. For further information, please contact Zuzana Vatráľová at IOM Bratislava, Tel: + 42 12 5273 3791, Email: zvatralova@iom.int.